I've been riding the 2015 Trek 7.2 FX for a few months now and overall enjoy it. 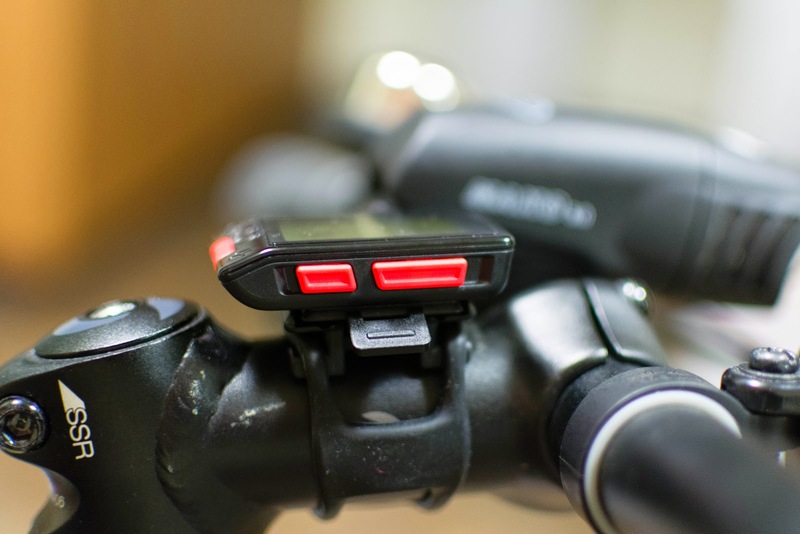 One of the features that attracted me to it was the option of the integrated speed/cadence sensor in the frame. Unfortunately I've had a hard time getting it locally and nobody would ship it to my location. On a recent trip to the U.S. I was finally able to pick up the Duo Trap S sensor and Bontrager Trip 300 computer. 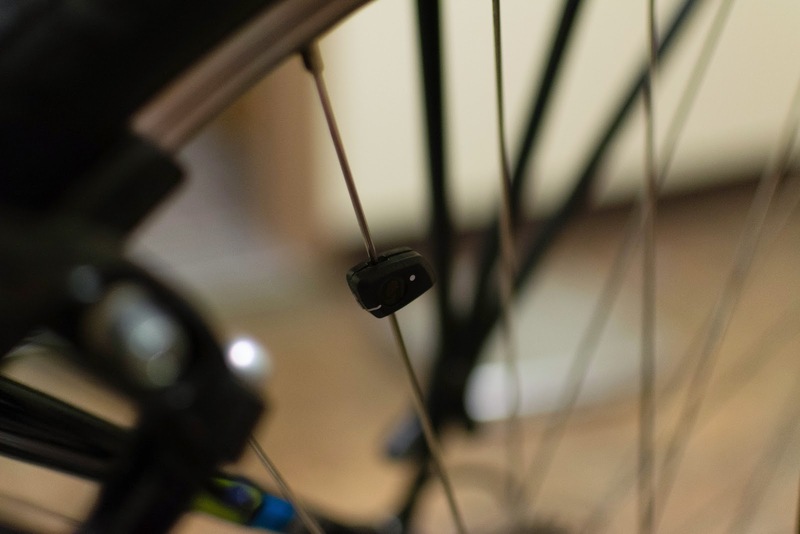 The sensor itself fits quite seamlessly into the bike. Just remove the plug and one screw later it's mounted. The two magnets are just as simple to mount. One clips onto a spoke and the other slides over a crank near the pedal. They include three different sizes of magnet for the crank and I had to use the largest one for the 7.2 FX. The sensor and frame have lines that show you how to position the magnets. If that didn't make it easy enough, the two round dots on the sensor actually blink when the magnet passes when it first starts up. 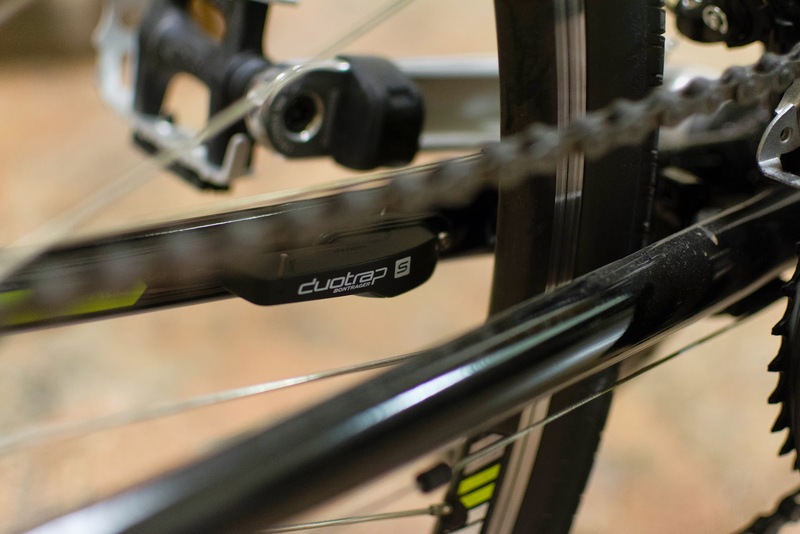 The Bontrager Trip 300 computer was just as easy to install. 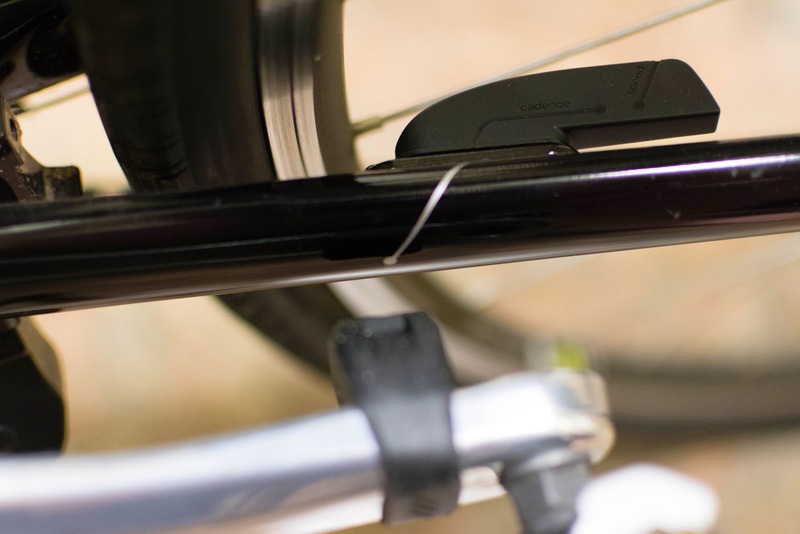 The mount has a rubber piece that will stretch around most any tube on your bike, and can be mounted in either orientation. The computer then just snaps into the quick release. I decided to mount it on the stem and it will probably stay there. It nestles in quite nicely in this location. The computer is pretty basic, and that's one of the things I like about it. If you move the bike the sensor wakes up automatically and the computer senses it and turns on too. They both use a standard CR2023 and should last quite a while on it. The setup is quick and painless. During the setup you can pair it with any Ant+ speed/cadence sensor and an Ant+ HRM if you like. It had no problem picking up my Garmin HRM. The little icons on the top left show you what sensors it has paired with and is currently using. After setup the controls are dead simple. The top button cycles the top display through speed, average speed, and max speed. The little triangle by the speed shows if you are currently faster or slower than your average speed. 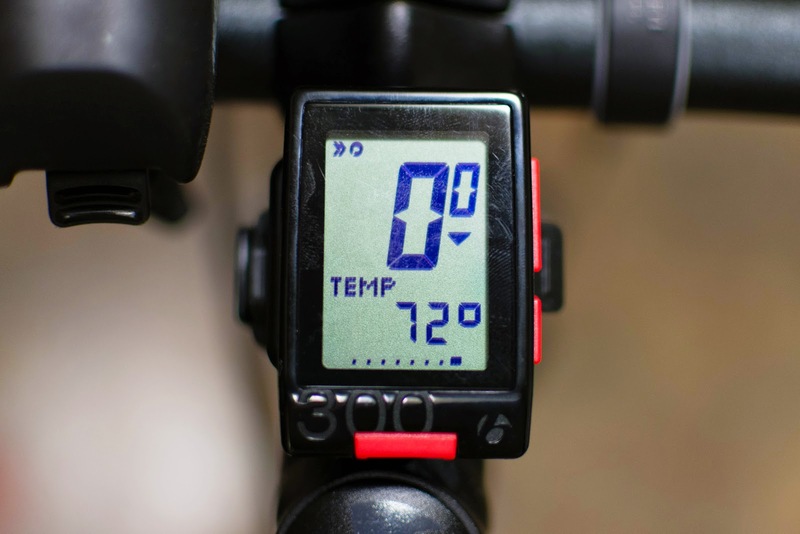 The bottom right button cycles between the clock, trip distance, trip timer, pedal cadence, heart rate (current, average, or max if you press the bottom button), Calories burned, total odometer, and the current temperature. The bottom button is the backlight. I also paired up the sensor with my Garmin Forerunner 405cx. After a quick two mile test ride the speed and distance were very close to each other. All I did on the computer was set the wheel size to 700x35. The Garmin looks like it updates some of the fields more frequently than the Trip 300, but you probably won't be staring at the two side by side to really notice most of the time. The sensor also has Bluetooth Smart aka Bluetooth 4.0LE (low energy). I was able to pair it with my phone and apps saw it right away. I don't regularly use my phone while biking, but for those of you that do this might be quite nice. Bluetooth and Ant+ work at the same time too. I had no issues with it in use. It wakes up on it's own and pairs quickly. It doesn't have any annoying beeps or crazy menus just to display simple data. It just works, and you don't get that in a lot of gadgets these days. It's a great mix of technology, design, and usability. I ended up buying two of these and they both only came with the magnet shown above. The crank comes with a set of three magnets though. I figure just about any spoke magnet will work fine as long as it trips the sensor. My computer works good except it only reads half as fast as I am going. Every thing else is working. Any suggestions? I bought one with my Domane 6.2 a few months ago. The inclusion of the heart rate monitor was the selling point for me. The worst buy that I could have made. No, it doesn't wake up upon movement. After resetting it sometimes works, but after a coffee break, it usually says that's enough for one day. Sometimes the odometer works but not the cadence. I've had it back to the bike shop probably 5 or 6 times. Always optimistic, but same outcome. Yes, the heart rate monitor is great! Sorry to hear yours is having problems. Mine has been spot on since installing. Wakes right up and everything works great. Maybe you got a bad unit, or it's something simple like magnet placement or low battery. I saw some people on other frames had to turn their magnets sideways to get them to register correctly. Great article review blog sharing. These blog is indeed very valuable indeed. Bike computer is really essential for bicycling. When you riding on a bicycle this accessories is needed to you.